I visited S. this week, one of my oldest college friends, because she lives sort of near the train station where I had to pick up RioGringa on her return trip from Boston. (My new motto: never drive anywhere for just one purpose.) Anyway, she starts telling me about an old guy friend of ours, I'll call him Cowboy D. We knew Cowboy D. as soon as he arrived at Dartmouth College, a sweet hick of the very innocent sort from the state of Montana, who still had straw in his teeth and an open jaw, from being so amazed at where he'd found himself out there on the East Coast. He was a good ol' boy, and still a boy, and a naive, hunk of a guy with charm and a longing to return to his home state, Ivy-educated, so he could become a politician. This got me to thinking, fantasizing, actually. What would I do if I had billions? If money really were no object?? And here's my pathetic conclusion: what I'd want, like right now, is a masseuse, on-call, who'd drop everything and come over and massage my neck/shoulder where I've had a muscle spasm for the past five days. Oh, and I'd buy a MacBook Pro. Maybe two, one for me, one for RIoGringa. And that's all I could think of doing with my new-found, imaginary billions. How sad is that??!!! Okay, first of all, I'm not blaming RioGringa for the fact that I didn't have time to post here for two days. I mean, it's not her fault that we had to go food shopping and shoe shopping and errand running several afternoons in a row. I do have a book to write, I mean a book to finish, before the end of the summer, which is RAPIDLY approaching. And I'm getting semi-terrifying calls from my editor, about completing various deadlines--other than finishing the manuscript--and also, by the way, can they completely change the title, she asks. AACK! Anyway, it's just that it's, well, her fault. RioGringa's that is. Not that I'm blaming her. . . .
Now, back to our regularly scheduled program: Boomers. This weekend, the first of our group of friends hosted her son's wedding, right in the neighborhood, a gala affair for 250 people. It was held under a tent, right next to a barn on a well-preserved local tourist attraction, a pre-Colonial farm and grain mill. The people in charge had to lock the cows in the barn for the occasion! No babies this time around. Oh no; this time around, it's this. Not a baby, but a dog. A bad dog. A dog who can take a nap during the day whenever she feels like it. That's why she can bark outside our bedroom door at 1:02 a.m., trying to get in so she can hop on our bed to sleep. And it's why she decides to try again, at 3:23 a.m. Hope springs eternal when you are dog wanting to get into the good bed. And when that doesn't work, it's why she tries again, at 5:54 a.m. Husband has been responding to this loud and insistent barking by opening the door and letting her in. Thus, she has successfully trained him to respond to her barks in the exact way she had hoped. And, as I've explained to Husband over and over and over and over, it's why she will never stop barking at night. Because it works. So, last night, I instituted a new training regime. She barks, I yell: "Go to bed! No!!" No door opens. And again, two hours later: she barks, I yell: "NO!" And so on. (Repeat X 4.) 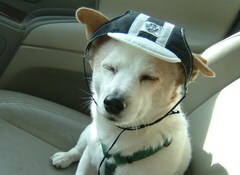 On fifth time, at 5:00 a.m.-ish, I open the door and push her barking head down with my hand. I yell, firmly: "No. Barking. No." Time will tell who is training whom. There are few things more boring--or more disgusting--than other people's mucus problems. Mine, though, are completely fascinating. To me. I never think of mucus, ever, until I have too much of it--like right now--in my head and in my nose and in my chest and in what feels like every cell of my body. I have some kind of rampant Mucoid Plague. Or terrible flu. Or maybe a cold. But whatever it is, I was fine until College Boy came home; he brought all of his nasty fraternity germs home, and my poor immune system couldn't cope. That's my story, and I'm sticking to it. I began running for exercise when I was in college, three-plus decades ago. At first, I didn't run very far, a mile or two at a time, nor did I try to go very fast. I just went. Living in New York City later on, I began to run longer distances, sometimes in Central Park, but more often around and around Washington Square, near my apartment. Once, a tourist stopped me, and inquired with a very Southern twang, "Are y'all in some kinda race?" as she watched a bunch of us run loops around the Square. I stared at her in confusion, and said, "Uh, no." She walked away, commenting, "How nice, y'all running together!" Which, of course, we were not. A few dozen of us were simply running laps around the park, at the same point in time, but certainly not together. We did, eventually, socialize together, sometimes having 'runner's parties' in a nearby apartment, or entering races together. Later, when I moved to the suburbs, I ran in a nearby park, with miles and miles of trails, and it seemed like heaven compared to those endless urban concrete laps. 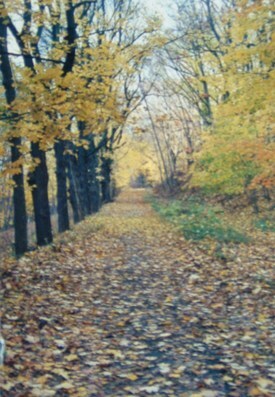 This is how the trail looks, in the fall. Actually, it is heaven, no matter what you compare it to. In time, I was running with a group of other moms, and we'd meet every Saturday and Sunday for a five- or six-mile run. Some of the others trained for marathons, though I never did. My knees bothered me after I'd run seven or eight miles, so I never tried to push myself. I ran for about thirty years, taking time off only during late pregnancy and when I was really really sick. I grew to love/hate running--sometimes I'd dread having to do it (and after a while, it really felt like an imperative), but I'd love how I felt when I was done. Then, a few years ago, I got planter's fascitis, or heel spurs. I was completely crippled, and I could barely walk, because of a cramped muscle in my heel. I had to give up running for about six months. After I had kind of recovered, I tried to work my way back, but then my knees started to hurt, and then my hips, and then I realized, with horror, that I was done running. I had become too old, and too creaky, to run anymore. So, now, I walk. I no longer run. And I wish I would have known, on that very last run I took, whenever it was, that that would be my last run ever. I would have appreciated it more. As I've said, boring to everybody but me, my computer has abandoned all reason. It's in a coma, on life support, and only a matter of time... before I am unable to even save my g - @$)@(#&%( -ed files and photos and settings. I curse you old computer! And the hot-shot high school kid I paid Big Bucks to build you!! (I am posting from another computer, because the Cursed One, Unblessed Be She, reboots .. every . . . two. . . minutes. Meanwhile, HBO's new show, In Treatment, began this week, to great hype. 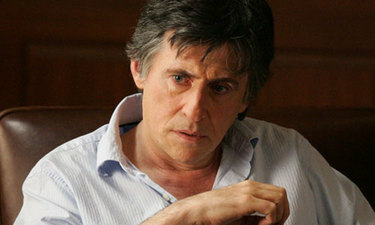 It stars Boomer Gabriel Byrne, born in 1950, as the therapist who treats a series of four patients--four nights in a row!--then sees his own therapist on the fifth night. No rest for the shrinkers, apparently. HBO alleges that this show is based on an Israeli show that was a blockbuster hit there. But my friend Harriet, who produces films with her husband, pitched this idea to HBO ten years ago. Back then, nobody was interested. Or that's what they said, anyway. I've only seen one show, but it drew me in, somewhat. I'm not sure I felt for the pretty young girl, the first patient, with commitment issues and a Major, Inappropriate Crush on her therapist. Though the fact that he didn't notice her passion makes him a not very good therapist, no? New computer, allegedly, arriving soon. If not, I will have no hair left, since it will all be PULLED OUT! Between Christmas and New Year's Eve, Manhattan is always packed, but this year, as a friend told me, "you need a machete to cut through the crowds." It took us 38 minutes to drive to West 55th Street, and another 40 minutes to drive about six blocks, where we could finally ditch the car. (For slightly more than three hours, it cost $30 to park!) 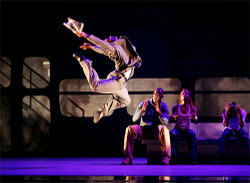 We saw "Love Stories," a work choreographed by Judith Jamison that featured great music by Stevie Wonder, and lots of throbbing, vibrant dancing that was nearly as much fun to watch as to perform. Next, was "Urban Folk Dance," a piece for two men and two women, danced at desks and office chairs in front of two chalkboards. I have absolutely and utterly no idea what it meant, and trying to figure it out made my head feel heavy. "The Groove to Nobody's Business" was a brand new piece set in a subway station, featuring a bunch of dancers waiting for a train, and then, I think, actually on a train. I guarantee that it's the most entertaining bit of art, ever, that focuses on subways. If RioGringa had been with me, she could have explained the movement here, and the way in which the dancers mimicked, so uncannily, the swaying movements invoked while sitting on a train. But she wasn't, so my fuzzy brain just had to deal. The last piece, "Revelations," I've seen about ten times, and it thrills and elates me every single time. Except last night. We were just so tired, that the thrill was gone. I can't figure out, though, if the performers were not as great, or if I've seen it so many times I'm no longer surprised. By the time we hit "Rock My Soul in the Bosom of Abraham," which always has the entire audience on their feet and cheering, we'd sneaked out into the lobby and were on our way back to our expensively parked car. TiVo Lady needs to recover from her cold. Fast.